Q-Connect CD Envelope Paper (Pack of 50) KF02206 Pack of 1 Q-Connect CD Envelopes. protective envelopes for the safe storage of CDs. Manufactured from paper with a slot in flap keeping contents free from dust etc. Colour - White/Clear. Q-Connect Polypropylene Envelope (Pack of 50) KF02207 Pack of 1 Q-Connect CD Envelopes. protective envelopes for the safe storage of CDs. Manufactured from strong polypropylene with a gummed flap keeping contents free from dust etc. Colour - White/Clear. 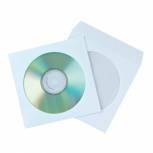 Q-Connect Black /Clear CD Jewel Case (Pack of 10) KF02209 Pack of 1 Q Connect CD Jewel Cases. Plastic, standard sized cases to keep CDs safe and clean. Colour - Black. 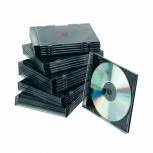 Q-Connect Black Slim Jewel Case (Pack of 25) KF02210 Pack of 1 Q-Connect Slim CD Jewel Cases. Plastic, space saving cases to keep CDs safe and clean. Colour - Black. 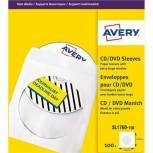 Avery Paper CD/DVD Sleeve XL Window White (Pack of 100) SL1760-100 Pack of 1 Avery Paper CD/DVD Sleeves. perfect for storing, protecting and posting CDs and DVDs. The extra large clear window allows easy viewing of labels, the perfect alternative to jewel cases. Colour - White. 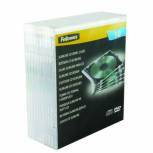 Fellowes Slimline CD Jewel Case (Pack of 10) Clear 9833801 Pack of 1 Fellowes CD Jewel Cases. 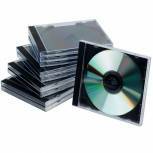 Quality plastic CD storage ideal for protecting CDs from scratches and other damaged. Slimline in design for space saving storage. Colour - Clear. 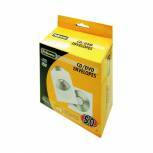 Fellowes CD Envelope White Paper (Pack of 50) 90690 Pack of 1 Fellowes paper CD envelopes. Equipped with a clear plastic window that allows for easy CD recognition. Hold one CD/DVD without jewel case. Clear plastic window allows you to view CD/DVD while also protecting your discs. 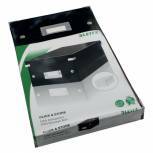 Leitz Click and Store DVD Storage Box Black 60420095 Pack of 1 Leitz Click and Store Media Storage Box. Stylish collapsible DVD storage box with label holder. Holds 22 standard jewel cases or 44 slim jewel cases. Laminated surface for long lasting protection. Dimensions W206 x H147 x D352mm.